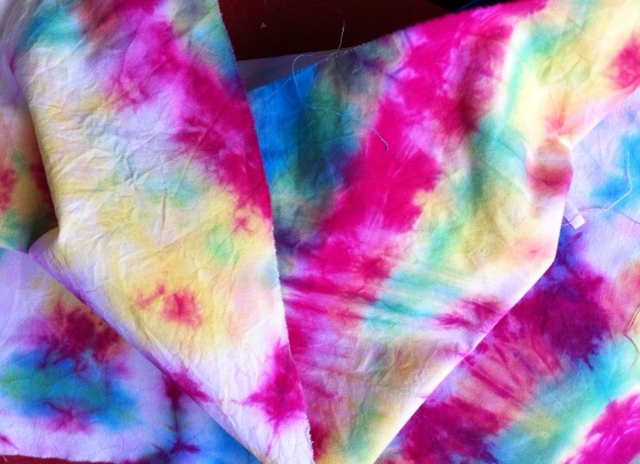 Its been a week of Tie Dye fun round here! Sometimes I get to escape from my studio and go to work with a great bunch of special people. There’s a fund raising coffee morning coming up in the Summer, so we are busy making crafty things that we can sell. 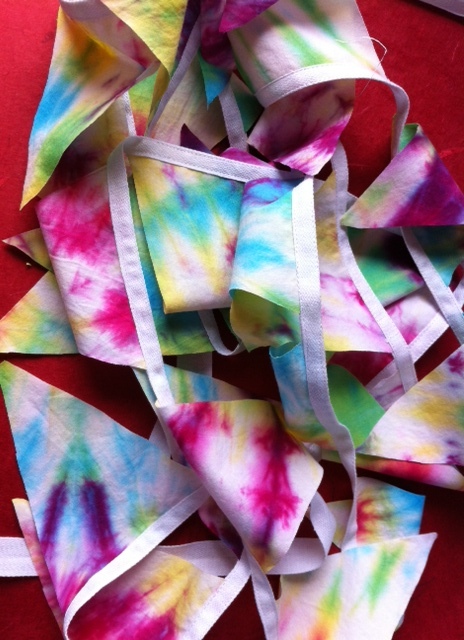 I make bunting myself, but wanted to find a quick and easy way to make brightly coloured bunting – so here it is! First of all we each tie dyed a fat quarter of cotton fabric using the Spiral method – for instructions look here on the Instructables website! Once washed and dried the fabric was folded and cut into triangles – one piece made 24 triangles. Each triangle – or pennant – was pinned onto cotton tape. We left about a 1cm gap between each. Then we machine stitched along the whole length, being careful to catch the fabric in the tape. We used two rows of straight stitch but a zig-zag stitch might be quicker and easier! Now we’ve just got another 12 to finish and then its onto papier mache brooches! This is going to be one colourful craft sale! This entry was posted in craft workshops and tagged bunting, craft, sale, tie dye on March 19, 2014 by donnacheshiretextiles.